However, the actual SCL frequency comes from dividing the CPU’s core clock by an even integer, so you can’t always get what you want. The Pi 3 ticks along at 1.2 GHz (actually 1.1 GHz, because marketing) from a core clock of 550 MHz, so a 200 kHz clock calls for a 2750 divider: 550 MHz / 2750 = 200 kHz. D0, the bottom trace, is SCL, D1 is SDA, and D2 is a trigger output not used in this setup. 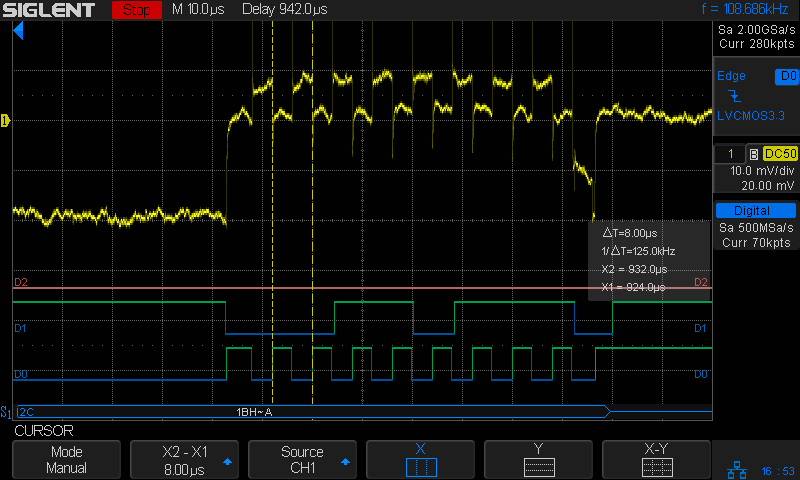 The yellow analog trace is the current in the SCL line between the Pi and the BNO055, about which more later. So a 200 kHz nominal frequency produces a 125 kHz actual frequency. The BNO055 pulls the clock low (“clock stretching”), which can (and does) cause problems, but it’s not active during the main part of the transfer where the Pi determines the SCL frequency. Apparently, the code converting the nominal I2C rate in config.txt uses a table of divider values intended for another CPU core clock. AFAICT, the boot code could divide the actual core clock by the desired I2C frequency to produce the appropriate value. This entry was posted on 2018-08-29, 07:41 and is filed under Electronics Workbench, Oddities, Software. You can follow any responses to this entry through RSS 2.0. Both comments and pings are currently closed.